Racial disparities in cancer mortality may be greater for cancers that are amenable to available early detection and treatment (amenability level). We investigated whether these patterns vary by age at cancer diagnosis. Using 5-year relative survival rates (5Y-RSR), we classified 51 cancer sites into least amenable, partly amenable, and mostly amenable cancers (<40 %, 40–69 %, ≥70 % 5-YRS, respectively). We examined whether racial disparities in mortality rates (African-Americans, Asian/Pacific Islanders, Hispanics, whites), as estimated through Cox regression models, were modified by age at diagnosis and amenability level in 516,939 cancer cases diagnosed in 1995–1999. As compared with whites, all racial minority groups experienced higher cancer mortality rates in the youngest age group of 20–34 years. 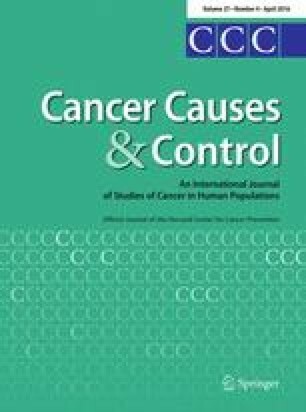 African-Americans and Hispanics diagnosed with partly and mostly amenable cancers had higher mortality rates relative to whites with cancers of the same amenability levels; further, these differences decreased in magnitude or reversed in direction with increasing age. In contrast, the racial differences in mortality were smaller and remained fairly constant across age groups for least amenable cancers. For example, in the youngest (20–34) and oldest (80–99) age groups, the adjusted hazard ratios (HRs) for African-Americans versus whites with least amenable cancers were, respectively, 1.26 (95 % CI 1.02, 1.55) and 0.90 (95 % CI 0.85, 0.96), while the HRs for African-Americans versus whites with mostly amenable cancers were 2.77 (95 % CI 2.38, 3.22) and 1.07 (95 % CI 0.98, 1.17). Cancer survival disadvantage for racial minorities is larger in younger age groups for cancers that are more amenable to medical interventions. The online version of this article (doi: 10.1007/s10552-016-0729-2) contains supplementary material, which is available to authorized users. This work was supported by the National Cancer Institute (K07CA151777) and Live Strong foundation. P. Tehranifar conceived of the research question, directed data analysis, and wrote the manuscript. A. Goyal, Y. Liao, and X. Fan obtained data, performed statistical analysis, and prepared tables and figures. A. Goyal participated in writing of the manuscripts. J.C. Phelan and B.G. Link provided guidance on the research questions and interpretation of results. M. Desai provided guidance of statistical analysis. M.B. Terry provided guidance on all aspects of the manuscript and participated in writing of the manuscript. All authors reviewed the manuscript and provided feedback. This study was determined by the Columbia University Medical Center Institutional Review Board (IRB) to be exempt from IRB oversight.